Catherine wants to wish everyone well over the holidays and, as a gift to you all, Forgotten is FREE on the 21st, 22nd and 23rd of December! Thank you to all who have supported her over this year! Seasons Greetings to you all! To celebrate the festive season, Catherine Gardiner has lower her price for Forgotten. The new prices are: £1.04 at Amazon UK, $1.68 (up to $3.68 in certain countries outside of the US) at Amazon, 1,29 € at Amazon Germany, Amazon France, Amazon Spain and Amazon Italy, ¥ 137 at Amazon Japan, R$ 3,42 at Amazon Brazil and C$1.62 at Amazon Canada. Thanks once again to everyone that has supported Catherine so far. Amazon have opened Kindle stores in Brazil and Canada! The prices for these countries will be updated very soon but, until then, welcome to the Amazon family! The sale has now ended and Forgotten has been increased in price. Use the links above to buy Catherine Gardiner's debut novel for $3.49 (up to $5.49 in certain countries outside of the US) at Amazon, £2.25 at Amazon UK, 2,80 € at Amazon Germany, Amazon France, Amazon Spain and Amazon Italy, and ¥ 281 at Amazon Japan. Remember, Prime members can download Catherine's book for free for a month. Thank you to everyone that has downloaded it so far! The FREE promo event has been extended to also run on the 1st and 2nd November! This will be the last free day Catherine Gardiner's book will have for a while. She is grateful to everyone that has so far downloaded, borrowed, or bought her book so far! 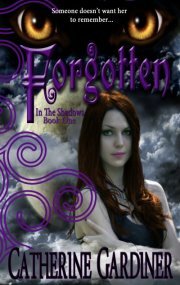 Forgotten is available to download for FREE on the 29th, 30th, and 31st of October as part of Catherine Gardiner's Ocktober Promo. Catherine wishes to extend her warmest regards to everyone who downloads her novel and wants you all to have a pleasant and safe Halloween! Now you can buy Forgotten in the Amazon Japan Kindle Store! It's currently priced at ¥ 100, for a limited time only. In other news the Amazon lending library is available at Amazon UK, Amazon Germany, and Amazon France. Prime members in those countries (and the US) can read a selection of novels free for a month, as part of their subscription, including Forgotten! After several delays, the first edition of Ask Cat is ready! If you'd like Catherine to answer your question in the next edition, please keep in mind that using her contact form is the best way to make sure it will be seen and passed on to her (unfortunately we cannot guarantee a personal response at this time but your email will be seen and forwarded if appropriate). Beginning the 27th September, Forgotten has a new price. Please go to the links above to buy Catherine Gardiner's debut novel for: $0.99 (up to $3.25 in certain countries outside of the US), £0.77 at Amazon UK, and 0,89 € at Amazon Germany, Amazon France, Amazon Spain and Amazon Italy. Catherine is so grateful for all the purchases and free downloads of her novel so a huge thank you from her to every last one of you! Catherine Gardiner's debut novel is going FREE again on the 6th September! Use the links to buy at the top of this page to get it for your Amazon Kindle or compatible device, relax, read, and enjoy! As of 1st September, Forgotten will be at a new price of: $2.99 at Amazon (up to $4.99 in certain countries outside of the US), £1.95 at Amazon UK, and 2,68 € at Amazon Germany, Amazon France, Amazon Spain and Amazon Italy. A big thank you to everyone who has so far purchased Catherine Gardiner's debut novel! As a last minute decision, the FREE day has been extended to two; get Forgotten on Thursday, 26th completely free on the Amazon Kindle! Wednesday, 25th July brings with it another FREE day. Get Forgotten while you can at the regular links provided on the homepage and elsewhere on this page. After careful consideration, it has been decided that Forgotten should be set at a lower price. It is still higher than it's ten day sale price (so other promotional sales can be had in the future), but lower than before. The new prices are as follow: Amazon at $1.79 ($1.84 if you live outside of the US), Amazon UK at £1.18, Amazon Germany for 1,50 €, Amazon France for 1,50 €, Amazon Spain for 1,50 €, and Amazon Italy for 1,50 €. Thank you to all that have already bought Forgotten, or that will at its new low price point! Forgotten is FREE on the 19th July! Go to the regular links on Amazon, Amazon UK, Amazon Germany, Amazon Spain, Amazon France, or Amazon Italy, to get your copy. The sale is now over. Catherine is grateful to all who decided to buy her book and she hopes you enjoy reading it! The new prices are: Amazon at $3.17 ($3.27 if you live outside of the US), Amazon UK at £2.10, Amazon Germany for 2,68 €, Amazon France for 2,68 €, Amazon Spain for 2,68 €, and Amazon Italy for 2,68 €. This is still below the original price, and means that other limited time sale events can be held in the future. The ten day sale has been extended so it covers Independence Day. It will be continuing for the time being, but there will be an announcement soon when the price of Forgotten will be going up again. Now is the best time to get your copy! Another FREE day arrives on the 27th June! After it's over, it will be going back to its ten day sale. Now is the best time to get your copy! Starting 21st June, Forgotten is in a ten day sale. Get hold of your sale copy at Amazon for $0.99 ($1.21 if you live outside of the US), Amazon UK for £0.77, Amazon Germany for 0,89 €, Amazon France for 0,89 €, Amazon Spain for 0,89 €, and Amazon Italy for 0,89 €. Forgotten is available for FREE on 18th June 2012! Get it quickly as it will be going back to full price after this date, although other promotions will be announced nearer the time. Forgotten is now available to buy at the Kindle Store! See the links at the top of this page to buy it from your countries Amazon (the regular Amazon covers other countries not listed) or check out the Forgotten (In The Shadows: Book One) Official page to find out more about the book. A new book and a new website! This website has been around for a while, but now it is finally out of construction and ready to be viewed! Use the links at the top to nagivate around and find out more about Catherine Gardiner, her new novel and how to contact her! Catherine apologizes for the delay, but is happy to report that her novel is now back with Everything Indie for some formatting magic. A big thank you to Everything Indie who went above and beyond with their excellent editing skills! Thanks to the amazing work from Vila Design, we can now show off the cover for Forgotten (In The Shadows: Book One)! Click on the picture for a larger version. Copyright (c) 2012 catherinegardiner.com. All rights reserved.